Capital Bikeshare tweeted this morning that it recorded 5,847 rides yesterday, an increase of 1,090 from the day before. Of those rides, 1,246 came between 2 and 4 p.m., compared to the 812 during that same timeframe on Monday. If you think about it, Capital Bikeshare’s 1,121 bikes distributed at the 116 stations throughout the District and Arlington are now an integral part of any plan for mobility or evacuation in case of an emergency in the city. Terry Bellamy, the director of the District’s Department of Transportation, admitted to the Washington Business Journal’s Mike Neibauer that, despite a lesser traffic nightmare than during winter snowstorms, the region just can’t handle the massive traffic exodus that invariably follows an emergency. If you’re in a car, you’re probably screwed. Now comes Hurricane Irene. Though the storm could of course weaken or shift away from the city, Mayor Bloomberg announced this morning that agencies are “preparing for the worst.” Across the Hudson, Mayor Dawn Zimmer is urging Hoboken residents to leave town (or at least move their cars). The MTA, for its part, is reportedly battening down the hatches and bringing in extra personnel. 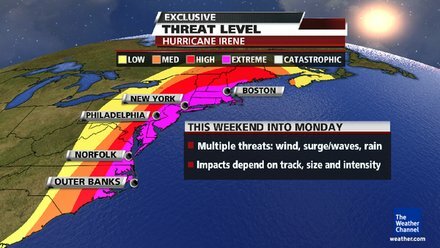 Irene updates are lighting up the Streetsblog Twitter feed; evacuation maps and “go bag” chatter are the order of the day. All of which means… what? How, if at all, are the week’s terrestrial and aerial turbulence affecting your mobility? Opinions on urbanity? Bottled water supplies? Let us know in the comments. I’m super skeptical of bike-share as a means of disaster evacuation; it would basically require that credit card networks be up and running AND that whomever uses a bike basically just steals it, since it wouldn’t make sense to bring it back before your half-hour is up..
bike commuters may be able to tackle rain/snow. but a hurricane is QUITE a bit step up from a downpour. when we are talking about 50mph+ winds, biking really is not a smart option. being outdoors in general is not a smart option. Anything close to a direct hit is going to disable subway service in a large area of Brooklyn on Monday, due to the possible need to move the trains out of the Coney Island Yard to safety. Fortunately, I’ll be able to ride my bike to work, for several days if necessary, to avoid problems on the F train. Larry, I dont know about you, but ive ridden a bike in 40mph wind gusts, and it is not easy, if not dangerous. thats why i say that in a hurricane, a bike may not be the best option to get out when a hurricane can have over 100mph winds. in fact, getting out during the hurricane in general is not a good option. if you were to evacuate, you need to do so on friday/saturday. @d8d46f16f380afef59ca318522397233:disqus I think the point of bike evacuation or any evacuation in general is to do so before the storm arrives. That being said, this hurricane is going to be for reals. Try to park your bike somewhere a tree won’t fall on it, and keep your bike helmet handy. Obviously it’s totally ridiculous to think of something with capacity for 1,100 people as “an integral part of plan for evacuation” etc. in Washington D.C. I think the point is that there’s no one-size fits all approach to emergency preparedness. 1,100 bikes won’t get everyone out, but neither would 1,000,000 cars. They’d be stuck in total gridlock. Cities have to have multi-faceted plans for evacuations based on the kind of situation that arises. Blizzards, hurricanes, earthquakes, terrorist attacks…all require their own solutions. Of course, bikes would also be a good part of one’s post-disaster plans. If a subway line was flooded out or damaged, you might still be able to ride to work if you had no other options. Think about how many people biked during the last transit strike. Danny G, I’m kidding of course. But many of the things that a lot of bike commuters have around the house make perfect items for a go bag. My power went out one night and having a few spare bike lights around was very helpful in finding my way up and down stairs in the pitch black. And it’s pretty easy to fill up a water bottle quickly if you need to get out of the house. I’m starting to charge all my batteries today just in case of a power outage. I’m miles from water, and 60 feet above sea level, so not much point of evacuating. I’ve also ridden with 40 mph gusts, carma. Not fun at all unless it’s a steady wind from one direction only. Back in the 1980s one day there was a nice, steady north-south wind of about 30-40 mph. I remember me and my brother going up and down Utopia Pwky several times. Against the wind you struggled to make 10 mph, but coming the other way you were going 45 mph. It was such a blast we did repeated it a few times just for kicks (and also to see the double takes when people saw us keeping up with motor traffic). I plan on crying a lot and watching Marcia Kramer on CBS2 wearing galoshes. Thank you Gargamel, now I know exactly what I am doing too. I expect the storm to be gone by the Monday AM rush, but the after effects on roads and transit to continue. That’s when a bike can get you there. It’s similar to the blizzard last August. I was the only guy at work the day after, thanks to an underground subway. I’ll jump in here since I grew up in Louisiana so this is really old hat for me. 1) evacuate early or don’t evacuate at all. Whatever you do, don’t try to evacuate during the storm. 2) If you’re staying, yes, bottled water is a good idea. Someone mentioned just filling up a water bottle from the tap as necessary.. but the whole point of buying bottled is that the waterworks may get shut off, or if the water treatment plants lose power the water may not be potable. We used to fill the bathtubs as well so you would have water to wash things and flush the toilet with (very important!) 3) Eat the perishables in the fridge and freezer now, and get some canned foods that you don’t have to cook for the next few days if you are worried about extensive outages. 4) If you own anything outside, tie it down well or bring it in. That said, I have no idea what to expect from a hurricane in NYC. But who does? I certainly don’t plan to ride my bike in it, but after it passes… yes! Is the following symptom of bike share delirium? “If you think about it, Capital Bikeshare’s 1,121 bikes distributed at the 116 stations throughout the District and Arlington are now an integral part of any plan for mobility or evacuation in case of an emergency in the city.” That’s roughly one bike for every 1000 people who are in D.C. during the work day. Compared to that, the lifeboat provision on the Titanic is worthy of a Nobel Prize. That said, I am very happy that a lot of people used the bikes after the quake. which reminds me. during the last transit strike, i simply biked to work from queens all the way to jersey. its actually quite easy. it took nearly as long as my normal bus->subway->bus commute. just a lot sweatier. even in the 20 degree weather. so, in a weird way. i kinda do wish the subways would shut down. at least i’ll get good exercise. Fat content: The levels of saturated or trans fats needs to be looked into before having such protein bars. It is recommended to go for bars with low levels of such fats, as these can be unhealthy. Products with dietary fat sources are the best alternative and also ideal to attain weight loss.